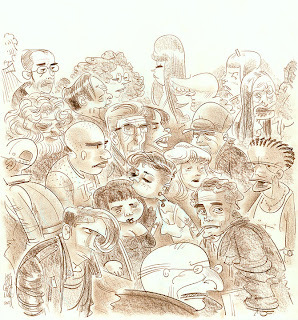 A quick sketch of city sidewalk traffic. Just for fun. This was written by bob. Posted on Wednesday, October 31, 2007, at 10:53 pm. Filed under Art, sketches. Bookmark the permalink. Follow comments here with the RSS feed. Both comments and trackbacks are currently closed. I dig this scenario a lot. Nice variations in people. I was in a George Grosz frame of mind, but to be put in Hirschfeld’s company is mighty flattering. I’d been paging through the Glitter and Doom book that was published in conjunction with the museum show of Weimar era German artists. Great stuff.